After the election, much of the discussion has been focused on working-class voters, but many of these discussions are heavily focused on white working-class voters and they largely leave out working-class voters of color. But if you look deeper, the economic anxiety that was said to be a driving force for those white working-class voters is stronger for people of color and it isn't being talked about that much at all. "In a CNN/Kaiser poll taken before the election, 63% of white working-class respondents said they were satisfied with their personal financial situation compared to just 40% of black working-class respondents." "White families, on average, tend to have 13 times more wealth than black and Latino families, according to the Pew Research Center." "Blacks and Latinos also tend to be paid less than whites and they are also more likely to have higher rates of unemployment than whites do. They are also more likely to live below the poverty line than whites." "One study by the Economic Policy Institute showed that black employees with more experience and education were still paid less than their white counterparts." "Another study by the Corporation for Economic Development and the Institute for Policy Studies said if current trends persist, it would take 228 years for black families and 84 years for Latino families to accumulate the same amount of wealth as whites." The labor movement has one message for all our members and indeed for all working people: You are not alone. We will stand together. We will protect the freedoms that make America and Oregon strong—and we will protect those freedoms for all who live and work here. By Jon Hiatt, Executive Assistant to the President and Chief of Staff at the AFL-CIO. This post originally appeared at On Labor. Rather than slice and dice the electorate into different demographics and voting blocks, we have to understand what happened on Nov. 8 not as a vote for or against the two candidates. Rather, it was something much larger. It was an expression of the insecurity of working people all over the formerly industrialized world, brought on by globalization forcing them to compete for work in a labor market without borders. Candidate Trump was correct when he said, "I see a big parallel" between U.K. voters favoring Brexit and U.S. citizens supporting him. Both were expressions of the belief that existing institutions of government are no longer protecting the security and well-being of working people in a global economy. Union officers who talk to their members will tell you that the insecurity and anger underlying the vote was real. And they also will tell you that if that insecurity and anger is not addressed, they will threaten liberal democracy and slow or even reverse our halting progress toward equality. Both candidates were right that we need to rebuild our physical infrastructure to compete in the global economy, but we also need to rebuild the infrastructure of government and society—most centrally the institutions that speak for working people, their unions. If we revive U.S. manufacturing without unions, we will not bring back good jobs. Factory jobs and jobs in the mines were not good jobs until they became union jobs and the same will be true in the future. Long before Donald Trump eyed the presidency, U.S. unions understood what our trade policy was doing to working America. Standing against democratic presidents, unions opposed The North American Free Trade Agreement and unions opposed the Trans-Pacific Partnership. Unions have called for an industrial policy that would train U.S. workers for high value-added occupations, rebuild our infrastructure, bring opportunity to disadvantaged communities and create green jobs. If we invest in infrastructure, shift our trade policy and encourage manufacturing without rebuilding our unions, the rich will get richer and the rest will get angrier. If we permit workplace raids and deportations that make people afraid to organize and divide workers by color and nationality, working people will lose rather than gain bargaining power. If we do not rebuild the institutions that used to insure that working people had a voice in government, working people will continue to lose faith in democracy. Yet within hours of the election results being announced, Trump’s colleagues in the Republican Party were planning exactly that—to adopt "right to work" laws weakening unions in Missouri, Kentucky and New Hampshire and to appoint a Supreme Court justice who will cut the financial legs out from under unions that represent firefighters, nurses, teachers and sanitation workers. If the president-elect allows his party to undermine the very organizations needed to deliver on his promise to working Americans, their rightful anger will not only drive him from office, but threaten to tear the fabric of our democracy. 1. Preserving the labor movement as the largest, most diverse institution in civil society. Our unions represent housekeepers in Las Vegas, crane operators in New York City and teachers in Shreveport. Almost half of union members are women and a growing number are people of color and recent immigrants. The divisions reflected in the recent election also exist in our unions and the divisiveness of the campaign has reverberations within and among trade unions. Maintaining local union halls, city labor councils, national unions and a federation where those divisions can be honestly discussed and common interests identified and pursued is our most critical task. 2. Ensuring that union members understand that they are the union. The necessary institutional structures that enable members to act collectively cannot become disconnected from the members. That can be challenging, since in many contexts unions do not draw the boundaries around the units of working people they represent. In many states in the public sector, for example, AFSCME represents broad, statewide units of employees in diverse departments, work locations and classifications. Nevertheless, starting in early 2014, AFSCME committed to a strategy of talking to all the one and one-half million working people it represents and asking those who were not members to join, and to date has succeeded in organizing a quarter of a million new members within its existing units. UNITE HERE is also a model in this respect, building a thriving culinary local in right to work Nevada that served as the foundation for election victory in that state as well as the defeat of Sheriff Joe Arpaio in neighboring Arizona. With the possibility that right to work will spread to Missouri, Kentucky and New Hampshire, and that the Supreme Court after a Trump appointment could impose right to work throughout the public sector, these efforts are more important than ever and will involve both millions of face-to-face conversations at workplaces and new forms of communications enabled by technological tools being developed at the AFL-CIO and in the larger unions, and disseminated throughout the labor movement. 3. Integrating new Americans into the workforce. Unions have always played an important role in integrating immigrants into the labor market, society and democratic government. This was true of garment workers in the sweat shops of New York City, factory workers in Detroit and Chicago, and farm workers in California. Periods of economic stagnation and insecurity have always made this difficult and, particularly during those periods, there have always been calls for exclusion, outside and inside the labor movement. But the labor movement has resisted those calls in the past several decades, calling for the extension of the full protection of our labor laws to all people working in this country so that there is no group that lacks an effective right to organize and is subject to exploitation that lowers standards for all. 4. Holding the president-elect's promises to working people up against his appointments and policies and results. 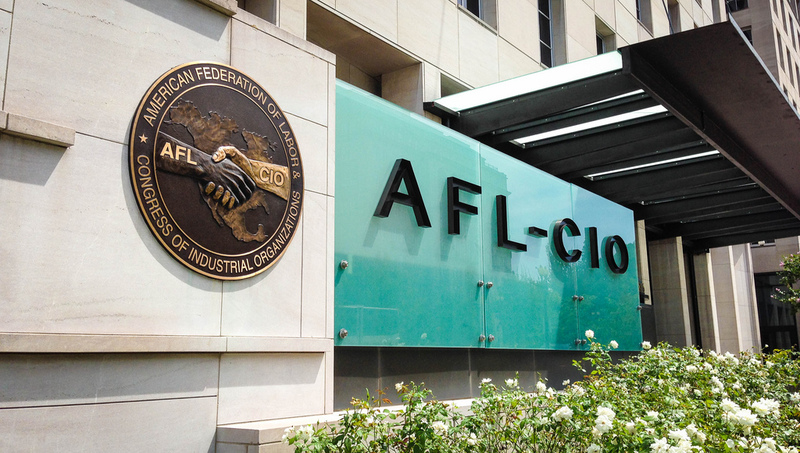 With Republican control of both houses likely to result in less than penetrating congressional oversight, the labor movement will be the center of an effort to inform union members and the broader public about how performance is measuring up to promises. And that yardstick will not be applied in one geographic area or among one group of working people, but on behalf of all working people. In the gaps between what was promised and what is likely to be sought and realized, is where we will develop the policies that will actually achieve the promised results, testing them where we can at the local and state levels and building the coalitions to enact them at the federal level four or eight years from now. 5. Organizing and bargaining. Despite overblown rhetoric about the death of collective bargaining and appropriate calls for a new labor law, unions will continue to organize within the outmoded and challenging structure of the National Labor Relations Act while also seeking new forms of collective action. Collective bargaining, itself, is a mechanism for social innovation—by workers, themselves. Safety and health practices that were developed through collective bargaining have now been socialized to the benefit of all workers, i.e., are now mandated by law. Other issues currently in vogue with legislatures, like flexible work schedules, were won at the bargaining table decades ago. Collective bargaining also serves as a mechanism for social integration: immigrant workers, for example, have won benefits at the bargaining table for themselves and their families that have made it easier for them to integrate into the workplace and into their communities. The president-elect complains about outdated and rigid legal mandates. But through collective bargaining workers will continue to express their collective needs and values on an equal footing with employers, instead of receiving protection from elites and self-declared leaders. The 14 million working people covered by collective bargaining agreements are the foundation both for any meaningful response to the insecurity and anger registered in the recent election and for the innovation desperately needed to give all working Americans a meaningful voice. Yesterday was a nationwide day of action calling for a $15 minimum wage. 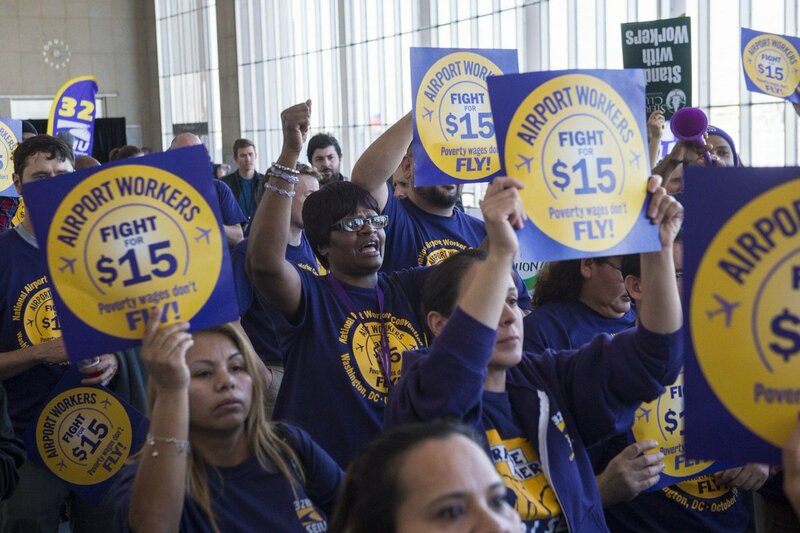 From airport workers, to Uber drivers, people in cities across America made their voices heard. “We won’t back down until we win an economy that works for all Americans, not just the wealthy few at the top,” said Naquasia LeGrand, a McDonald’s worker from Albemarle, North Carolina.